How can graduations be approaching already? This year is going by way too fast for me. 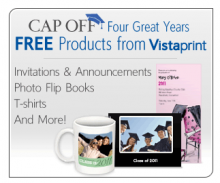 However, if you have a graduate in your family, you might want to check out this offer from Vistaprint. They are offering six different products for your new grad for FREE. You will just have to pay shipping costs. Choose from Invitations, Announcements, T-Shirts, Flipbooks and more. Head over to Vistaprint to see the full list of FREE products.